Set tasks and assignments: Whether it is a quick task or a bigger assignment, Edmodo allows you to easily set dates and provide information and resources. In addition to this, once submitted feedback can be provided in a timely manner. Only limitation is focus on scoring, rather than rubrics. Provide links and resources: Although URL shorterners and QR codes make it easier to share long webpages, there is nothing better than simply clicking on a link. You can also provide additional materials, such as documents and images to support learning. A place to respond and reflect: Along with sharing material, Edmodo provides a place for students to post and comment. There are different options associated with this and it can all be locked down by the teacher if needed. Posting can occur within a group or directly with a teacher, but never between students. Include parents in learning: Parents can be provided with a group code to connect. This does not mean that they will be able to see everything, instead they are connected with their child, having access to assignments, events, alerts, direct messages and anything else you tag them in. Connect with other teachers globally: An underutilised function, Edmodo provides the ability to connect with teachers in a safe and secure environment. The initial setup asks for information about subject areas, this then aligns teachers with others in their subject areas. There is a stream of information provided that allows people to share and connect. This not only provides the means for finding ideas and resources, but also for collaborating with teachers around the world. It needs to be noted that Brookside has signed up for School Account. Not only does this help to organise things, but it prevents students from signing up as a teacher and creating their own groups. 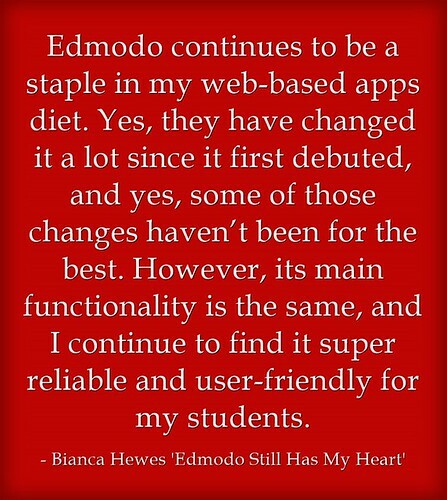 Edmodo Support Site – a collection of frequently asked questions associated with every aspect of Edmodo. Social Networking for Schools by John Pearce – a thorough presentation from John Pearce looking at all the different elements to consider when it comes to Edmodo. Edmodo Still Has My Heart by Bianca Hewes – a reflection from a Secondary teacher on how she uses Edmodo within her classroom. 7 Steps on How to Use the New Edmodo by Blake Waldman – A collection of ‘how to’ videos associated how to do different actions within Edmodo. Should my class blog, tweet, Google App, Moodle, Desire2Learn, or Edmodo? Arrghhh!!! by Royan Lee – A comparison of the different Learning Management Systems and social media platforms available and things to consider. Introduction to Edmodo by Aaron Davis is licensed under a Creative Commons Attribution-ShareAlike 4.0 International License.